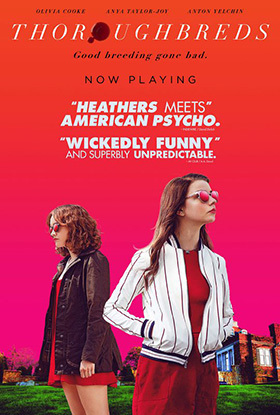 "Heathers meets American Psycho" reads the drop quote on the poster of Thoroughbreds, the debut feature from writer/director Cory Finley. It's a tasty little tag and accurate enough, in its way. There's a wicked satire under the cultivated surfaces and carefully groomed front, but a chilly alienation sets this teen-killer thriller apart from the flamboyant films of the quote. Olivia Cooke (Ready Player One) and Anya Taylor-Joy (The Witch; Split) star as Amanda and Lily, estranged childhood friends who reconnect in unusual circumstances. Amanda was pulled out of school after a particular act of violence made her notorious in their insular circle, her deadpan candor and blasé attitude essentially leaving her a pariah. Lily, at first glance, is a Cinderella in a gilded prison created by her creepy stepfather (Paul Sparks as a cold, sleazy power player who bullies Lily's mother). Their teenage playdate is a rental arrangement, at least until Amanda confesses she has no feelings and models her emotional reactions on the social cues of peers and parents. She's a budding sociopath, we assume, ready to pull golden child Lily into her darkness. But that vulnerable, awkwardly earnest girl we first meet is never again seen after Amanda pushes Lily into dropping her smiling mask and letting her true feelings out. More than liberating, it is disturbingly revealing. Think Heavenly Creatures in the dispassionate culture of Connecticut affluence and directed at a deliberate remove. Playwright Finley brings a Kubrickian quality to his imagery: minimalist frames, a clean, uncluttered beauty, and a tidy balance that emphasizes the order of this world of formal facades and social impressions. There's a crispness to the scenes and a brittle atmosphere that Lily takes pains not to snap until Amanda's arrival. Our golden girl, however, has her own issues. She just hides them better. It's a highly controlled film about control, which makes the introduction of Anton Yelchin's scruffy drug dealer to the children of privilege all the more welcome (it's the last role the young actor completed before his untimely death in 2016). Sure, he's a born patsy, but under his stoner braggadocio is an innocent out of his depth in the milieu of calculating upper-class kids. His low-key chaos is like a fumbling jazz solo in the midst of a chamber piece. Thoroughbreds takes an interesting tack on cinematic sociopathy. Amanda may not have feelings of joy or rage or love, but she does appreciate companionship and loyalty and, in her way, looks out for Lily. Poor little rich girl Lily, however, harbors depths of resentment and it doesn't take more than a nudge to start contemplating how best to get rid of stepdaddy dearest. Best laid plans and all, it still manages to offer a surprise that, if not narratively convincing, adds a touching act of sacrifice to the cool, darkly witty drama. Dreamy and disconnected, it's a miniature that favors carefully crafted atmosphere and psychological intensity over murder-mystery logic. The perfect crime isn't nearly as important as the perfect presentation.